The luxury chaise lounge chair is a welcome addition to any modern living space. Exciting and a tiny bit hedonistic, they’re easily incorporated into a wide variety of interior design schemes. Looking for a new piece to add spark to your home? Look no further! Isn’t that a French dessert? Chaise lounge chairs are genuinely the ideal resting place to enjoy all the best things in life – drinking, eating, and conversation. These days, the majority are upholstered sofas in varying sizes designed to support your entire body as you stretch out. Those who enjoy them in their homes appreciate them in much the same manner as our ancient Roman cousins, reclining with a glass of wine and a good discussion partner. The chaise you choose depends on its intended position in your home. The chaise lounge chair for living room or bedroom décor are the most commonly available on the market today and are available in many different styles and upholstery options. Take a quick look at your existing furniture and decide on whether you want to try to match your décor or invest in unique chaise lounge chairs to ‘shake it up’ a bit. You’d be surprised how a chaise in a contrasting fabric like leather, velvet or even animal print can add polish to your existing sofa or loveseat. Interior or Exterior? Hard or Soft? When purchasing a chaise lounge, you need to take a good look at its construction. Indoor and outdoor chaise lounges are more durable if they are constructed from hardwood such as maple and oak. It’s the ideal choice if you have a busy family or lots of pets as the wood holds up better against bumps and scrapes. Childfree household? Softwood is the way to go. Typically less expensive, softwood chaise lounges are crafted from wood such as fir and pine. Keep in mind that softwood versions are not safe for the exterior. You’d be better served by plastic, metal or finished hardwood models. 1StopBedrooms has scoured the market to bring you a comprehensive selection of chaise lounge chairs. Each piece is backed with a free one-year warranty and is offered at prices only we can bring you. We purchase directly from the manufacturer, and in combination with our coupons, continual online discounts, and no sales tax policy, there is no better place to invest your hard-earned cash. 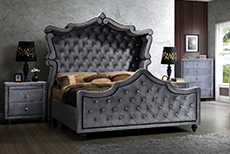 Bring one of our stunning beauties home today and recline in style.